This design is one of many to choose from in our lightweight stained glass dome design collection. With the awe-inspiring look that a stained glass dome can create in a large building, including the shear scope of the design, many might immediately assume that the stained glass dome must weigh at least a ton. With the concern over the weight of a stained glass dome, many might hesitate to install one because they think that the construction and installation process must be too complicated or expensive. However, with the innovative stained glass dome process used at Stained Glass Inc., we can solve all those issues and change mindsets about just how much a stained glass dome actually weighs. The idea of heavy stained glass domes has been solved through a unique process that uses different materials and ways of manufacturing to make the entire stained glass dome lighter. First, the stained glass domes that Stained Glass Inc. makes uses a different type of framing system, which is lighter in weight without losing any of the strength or durability that is essential to hold the stained glass in place. Previous materials were much heavier, which put considerable weight on the structure and the stained glass dome itself. However, the new materials make it easier to install and take the pressure of the building. Second, the manufacturing and installation process use what is known as a modular process. This means that it is made and installed in pieces rather than as a whole stained glass dome. Instead of using heavy equipment to install the entire dome, the work can be done easily by a few people in a fraction of the time. If you have an existing skylight, you can simply install the stained glass dome right over that area. This way, natural light is already available to flood through the stained glass dome. If you do not have an open space in your structure to access natural light you can use a light box that is installed first to a ceiling and then have the dome placed over it. There are even options to combine the skylight and light box to create light night and day through the stained glass dome. 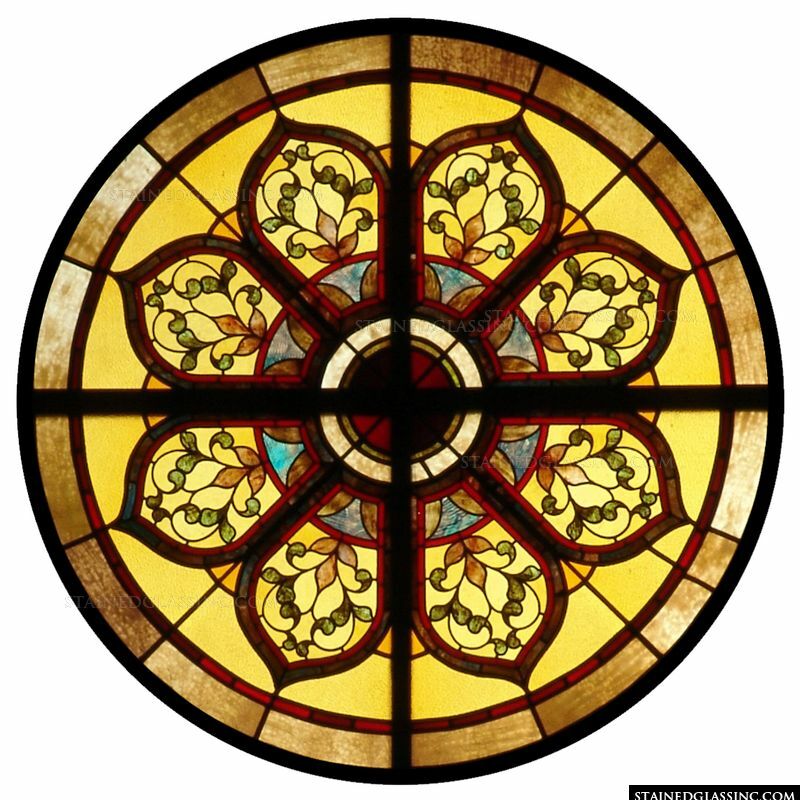 Free Stained Glass Dome Estimates from Stained Glass Inc. Working on projects all over the world, the team of artisans at Stained Glass Inc. is adept at custom designing all types of stained glass domes in various sizes, shapes, and designs for all types of structures. To find out just how easy it is to add a lightweight stained glass dome to your structure, including getting a free estimate and design consultation, contact our team today. You can reach them through our contact form or by calling our team of stained glass specialists at 903-454-8376. 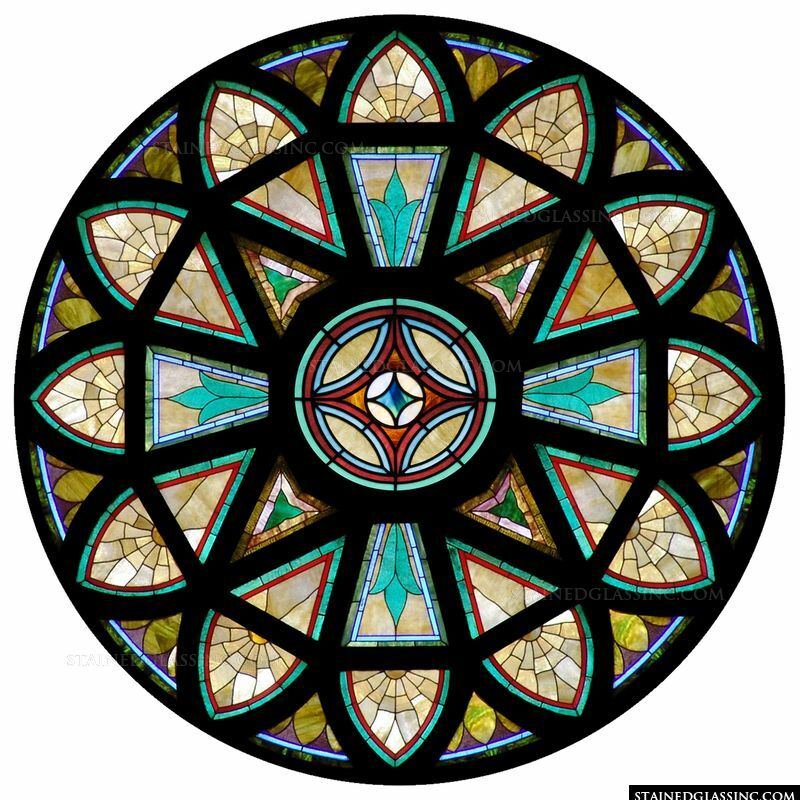 This stained glass dome design would make a stunning inverted stained glass dome. Stained glass domes add a stunning focal point to any room. While you may often imagine looking up into these domes, there is another style that provides a new perspective on a stained glass dome. The inverted stained glass dome essentially turns that dome upside down, providing an interesting architectural feature that adds color and atmosphere. An inverted stained glass dome is a great addition to any structure where there is an existing cathedral ceiling or domed feature that could be enhanced with color and light. By inverting its shape, the color and light fills a large space and brings that effect closer to the viewer. However, in some artistic spaces, you can add an inverted stained glass dome to an existing stained glass dome for a spectacular effect. Another way to do an inverted stained glass dome is to make it into a light fixture that hangs down from a ceiling. This way, these can be made to a smaller size and placed over spaces to create an intimate feel. Either way, the inverted stained glass dome adds interest to the architectural and interior design while bringing in more light that always helps illuminate a space and make it feel more welcoming. Inverted stained glass domes can be added where an existing skylight or stained glass dome exists. You can add to the existing design feature by enhancing the beauty with an inverted dome for a more dramatic effect. If you do not have a skylight and are just attaching the inverted stained glass dome to an enclosed dome or ceiling, you can use an artificial light source within the inverted stained glass dome to create an illuminated and colorful effect. You can use both an existing skylight and an artificial light source to provide different moods with the inverted stained glass dome both day and night. No matter what you decide to do based on your existing structure, you do not have to remodel to add an inverted stained glass dome. The inverted stained glass domes are made to order, using a modular design. This means a fast and easy installation. Stained Glass Inc. has designed and manufactured extraordinary inverted stained glass domes for all types of buildings and architectural styles. Each inverted stained glass dome is constructed from lead-free, environmentally friendly stained glass by U.S. stained glass artists. Working directly with the artists in their studios means you can enjoy wholesale ordering, pricing, and shipping as well as direct communication with the designers to ensure you get exactly what you want. To get a free estimate or learn more about adding an inverted stained glass dome to your building, including existing stained glass design options or advice on how to create your own stained glass design, please fill out our contact form or call our team of stained glass specialists at 903-454-8376. This is one of many stained glass dome designs offered by Stained Glass Inc.
A stained glass dome is one of the many types of artistic stained glass products made by the artisans at Stained Glass Inc. Over the years and the course of many successful stained glass domes produced for clients all around the world, a wide range of benefits have been realized in adding such a feature to all types of structures. Showcase a specific area of your building or structure. Create a strong visual impression. Add to your brand or company identity. Include a rich aesthetic to enhance the building’s architecture and interior design features. Heighten a ceiling or enlarge a room’s appearance. Bring in more natural light or colorful light effects that alter the mood of a space and brighten any dark spaces. Invite the outdoors inside for a closer relationship with nature that has been known to help stimulate productivity and lighten the mood. Incorporate art in a new and interesting way. Assist in regulating the temperature of a building or structure’s interior space. While you might think that, despite all these benefits, a stained glass dome is too difficult or costly to include, think again. The Stained Glass Inc. process for custom stained glass domes is to use a modular process in which segments are created and assembled on-site for easy installation. Even better is the fact that no construction is necessary. Just use an existing skylight or, if that is not available, use an artificial light source like a light box to illuminate your stained glass dome. These options can even be combined so that benefits of the stained glass dome can be enjoyed both day and night. Stained Glass Inc. offers a catalogue of extraordinary, unique stained glass designs but also encourages customers to create their own stained glass designs that may incorporate a set of colors and/or imagery that reflect their business. This provides an opportunity to personalize the stained glass dome. Because Stained Glass Inc. uses high quality, environmentally friendly, and lead-free stained glass made from polymers that have been proven to withstand many forces, these stained glass domes are made to last for decades to come. The highly experienced stained glass artisans work directly with customers on every stained glass dome project. This provides reassurance and confidence that the stained glass dome produced will meet expectations. Even better is the factory-direct pricing and shipping for affordability and convenience. To view our catalogue of stained glass dome designs, to ask a question, or to submit your own stained glass dome design idea for a free estimate, please fill out our contact form or call our team of stained glass specialists at 903-454-8376. One of many places well suited for a stained glass dome is a dining area. Depending on the type of building and architectural style, a stained glass dome could be added many different ways to change the look and feel of this gathering place. Here are some options for adding a stained glass dome to a dining room, cafeteria, or dining hall including what it offers as a design element. Why Add a Stained Glass Dome to a Dining Area? Dining areas of all sizes and shapes could benefit from a stained glass dome as it provides a unique design element to the room while also adding color and light to enhance the mood. The stained glass dome is a great way to warm up a room while also creating a soft glow in the evenings for enhanced ambiance. It can even reduce glare in the room. Other reasons to add a stained glass dome to a dining room is that it can change the feel and size of the room, giving a smaller room a more spacious feel through the addition of light. For a grand dining room, the stained glass can provide a more intimate feel and add ambiance. Lastly, certain architectural styles were known for stained glass as part of the overall look, including the arts and crafts movement and Craftsman style homes. Adding a stained glass dome as part of the dining area is a way to enhance that architecture and restore the building back to its original architectural style. • We have an extensive catalog of stained glass designs that work well with any style of living room, including those that are designed in the style of Frank Lloyd Wright or Tiffany. We also have everything from nature and landscape to patterns and mosaics. • Our custom design service also lets you create your own stained glass design for your dining room. Besides a custom design, this also means that we can make you stained glass for your dining room in just about any shape or size. • Our team of stained glass artisans has a portfolio of work that illustrates the depth of their creativity, expertise, and attention to detail. • We only use environmentally friendly materials, offering a safe and healthy alternative to stained glass that has been made with lead. • When you work with us, it means factory direct access to custom stained glass that is competitively priced, offering significant value for you. To learn more about our stained designs and options for a stained glass dome for your dining room as well as to get a free estimate, please fill out our contact form or call our team of stained glass specialists at 903-454-8376. Stained glass domes are not just for libraries and foyers. In fact, stained glass domes have a place anywhere in a home because they add beauty, light, and ambiance. One of the best places in the home for a stained glass dome is the kitchen. As the gathering spot of the home, the stained glass dome provides warmth and comfort. Today’s kitchens have become a true focal point in the home, increasing in size and scope to accommodate more entertaining and to create an ideal space for cooking. Many now include large seating areas to visit and eat while those in the kitchen can feel involved while they prepare and cook meals. With this greater role comes the demand for more unique spaces that reflect the owner. Adding a stained glass dome in the kitchen provides a great way to personalize this area of the home while enhancing the interior design. Additionally, kitchens may not always have the best light source, depending on where they are in the home. Adding a stained glass dome is a way to introduce more light – natural or artificial – as well as luminous color to the area. A brighter kitchen not only helps in a practical way, but it also brightens the mood of the space. • Stained glass domes in the kitchen can be added to an existing skylight or a light box can be included to bring the colors to life in the day or evening. • With a modular design, stained glass domes will fit in all types of kitchens because they are all custom made. • A stained glass dome can be designed in any number of ways and include all types of imagery, including nature, something related to the kitchen, a replica of a painting, or any number of geometric patterns or scenes. You can use an existing stained glass dome design or create your own. Either way, you are only limited by your imagination. • Friendly and responsive service, including answers to all your questions about stained glass as well as how to measure, order, and install. To get a free estimate or learn more about adding a stained glass entryway dome to your home or business, including available stained glass designs and options, please fill out our contact form or call our team of stained glass specialists at 903-454-8376. Stained glass domes offer a way to add more light to a space as well as create a way to add color and interest to an area. One area that can benefit from a stained glass dome is an entryway or foyer. An entryway to a business or a foyer in a home is where first impressions by a visitor can be formed. In one way, the entryway becomes a little room that requires decorating to create the mood for that space. It’s important to make this area as inviting and comfortable as possible, setting the tone for the rest of the visitor’s experience as they make their way inside your hotel, restaurant, store or home. Since a stained glass dome adds light – natural or artificial – this can brighten the space, creating that warmth and friendly feel you want to invoke as visitors come through the front door. The use of color can also enhance that effect while the pattern or design selected for the stained glass dome adds a focal point to the entryway or foyer. It can even make such a bold statement as to create that jaw-dropping effect that a hotel, casino, or resort may want to produce in its visitors. Stained glass entryway domes can use an existing skylight in the entryway or foyer and use natural light or a light box can be installed within the stained glass entryway dome to use artificial light. This allows for the stained glass entryway dome to create awe, day or night. Stained glass entryway domes can be made to fit any space because they are constructed from a modular design, so customization and installation is fast and easy. There is an extensive collection of stained glass dome designs to suit any taste, interior design, or architectural style. This can include patterns, geometric effects, scenes, and themes that are either religious or non-religious in their message. Even custom stained glass entryway dome designs can be used. Stained Glass Inc. is an excellent partner to choose when designing, manufacturing, and installing a stained glass entryway dome. The advantages include the ability to work directly with the stained glass artisans and stained glass studio to get exactly what you want for your stained glass foyer dome without paying a retail price. The Stained Glass Inc. team has been designing and manufacturing lead-free, environmentally friendly stained glass for years. The team has a portfolio that illustrates a strict adherence to high-quality craftsmanship on every stained glass project. To get a free estimate or learn more about adding a stained glass entryway dome to your home or business, including available stained designs and options, please fill out our contact form or call our team of stained glass specialists at 903-454-8376. 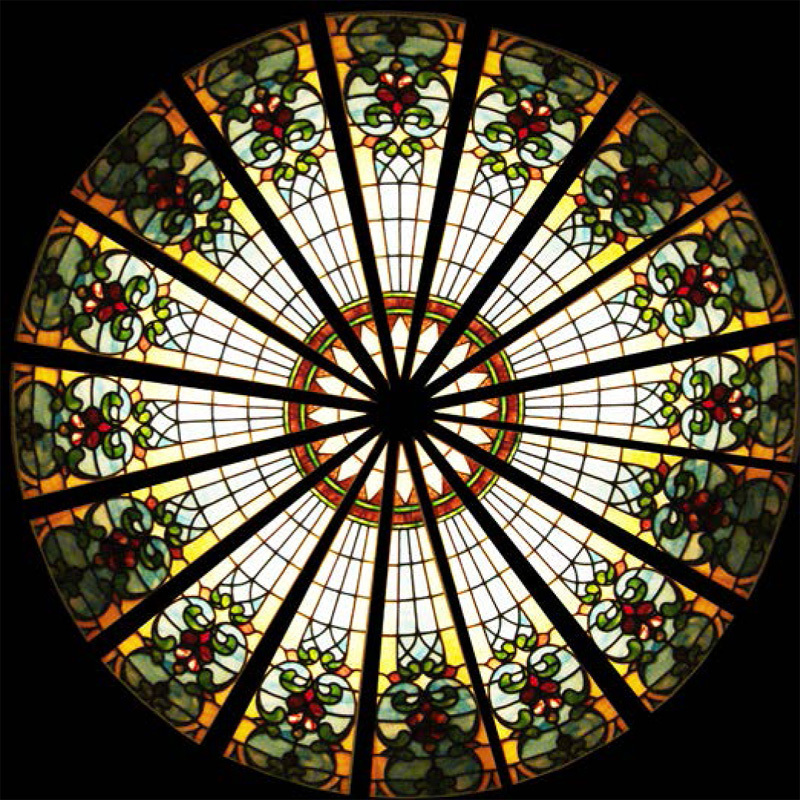 Create any shaped stained glass dome you can dream of with Stained Glass Inc.
A stained glass dome can be that central feature to your hotel, casino, government building or university that completes or unifies your architectural style. At the same time, it adds light and ambiance. Not to mention, it can leave your visitors and guests in sheer awe of its grandeur and elegance. Stained glass domes from Stained Glass Inc. are constructed by using a modular design process that is intended to make the manufacturing and installation process for these domes as easy and fast as possible. The other advantage to using this modular design process is that every stained glass dome we make is essentially a custom product for our clients. Although you may think that a stained glass dome has to be dome shaped, these stained glass features can actually be manufactured in any shape to fit any existing space in your structure. This enables you to minimize or even skip any construction in order to add that stained glass dome. Besides these examples of shapes, there are many more options available. Practically any shape can be made for your stained glass dome in the size you need. Since they are made to order, you can be assured that it will fit your space. Our team helps you with the measuring process and also provides consultations along the way to ensure you get exactly what you want and can install it. In addition to the shape and size, we also offer a way to add the stained glass dome so that it fits with an existing skylight or opening in your structure. The other option is to incorporate one of our LED backlit structures so you can still enjoy the stained glass dome without having to rely on natural light or for nighttime illumination. These features also can be incorporated with any shape you want for your stained glass dome. Working with Stained Glass Inc. 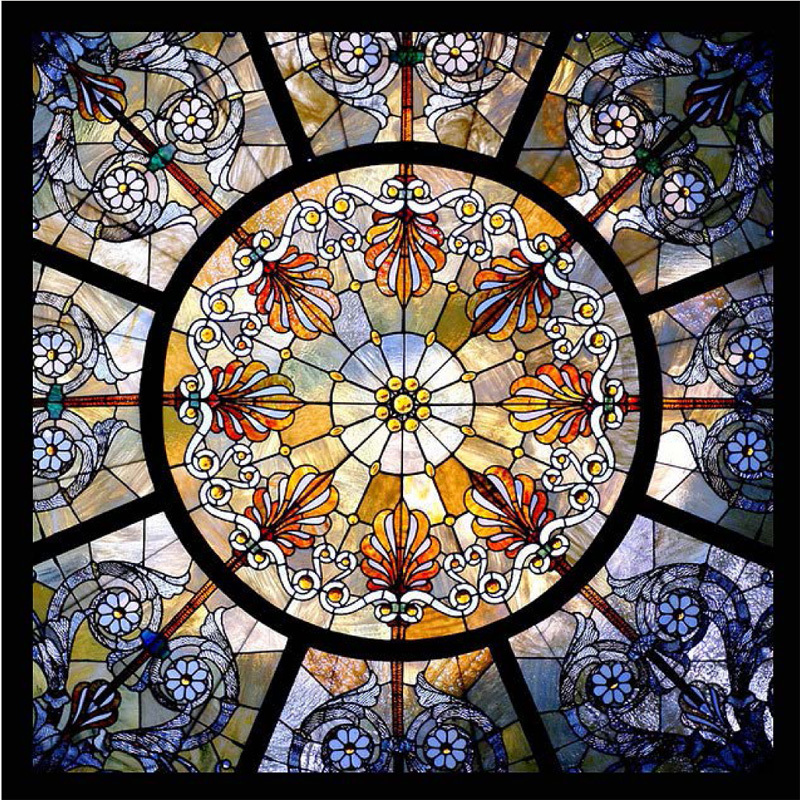 Besides being able to order your stained glass dome in any shape or size, there are other reasons to consider working with Stained Glass Inc.
Our existing catalogue of stained glass designs for domes provides an array of styles and patterns to fit your architecture. We can also work with your own design ideas and turn that into the stained glass dome of your dreams. Our skilled stained glass artisans have worked with stained glass for years and have portfolios of their beautiful, high-quality work. Our materials do not use lead and are environmentally sound not to mention strong and long lasting in terms of support, structure, and color. Our factory direct process provides a convenient and low-cost way to incorporate a stained glass dome in your structure. To learn more about our stained glass dome design and manufacturing process as well as get an estimate on the shape and size you want, please fill out our contact form or call our team of stained glass specialists at 903-454-8376. This colorful stained glass dome design can be created in any size imaginable. Stained glass domes provide a dramatic look to any building with its varied color and light displays as the sun or artificial light source shines on it. You may think that you must have a large space to include a stained glass dome. However, these stained glass domes can be customized to fit just about any space, inspiring viewers and lifting moods. 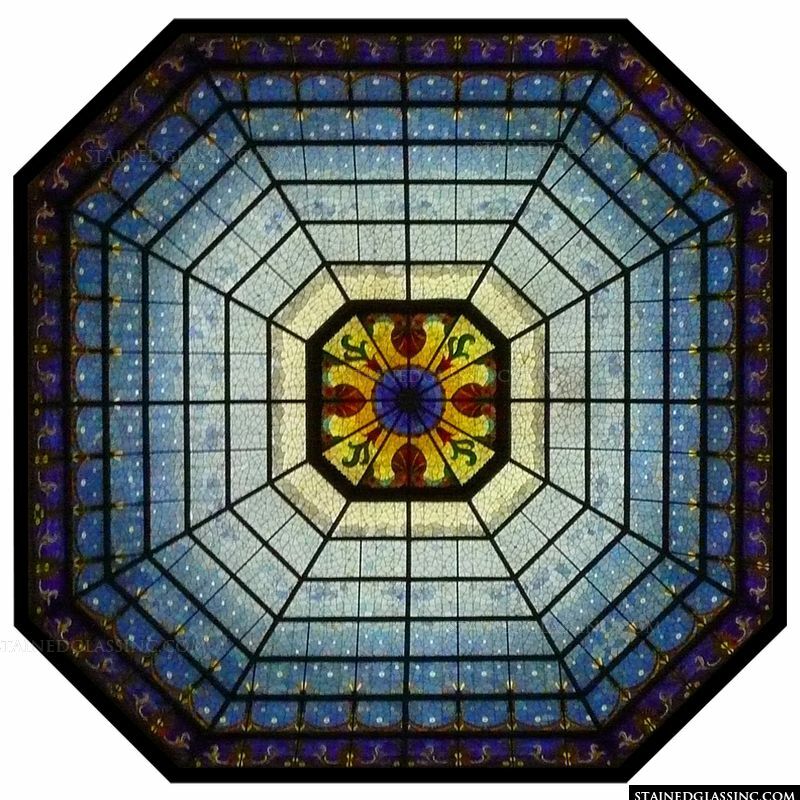 Will the stained glass dome be an interior dome below a skylight, a stained glass exterior dome gazebo, or an interior stained glass dome that sits below a light box? This will change the custom size you need. Where will you be adding this beautiful ceiling? All architectural elements need to be sized to be proportionate to one another so you want to make sure you create a custom size of stained glass dome that is a similar size to any other elements in the structure. This way, the stained glass dome will not dominate the room or be lost in the scope and space of the area. Our catalogue for stained glass domes has an extensive array of domes sizes in various shapes. However, that is not all we offer because we realize that not every space will be a standard size. That’s when we work with clients to create a custom size designed to fit their ceiling or gazebo. Having this design freedom to create a custom size provides a way for anyone to add this spectacular architectural element to their building whether that is a restaurant, casino, pool room, hotel or entry just to name a few applications. Along with the custom size, you can also create your own unique design and color combination for the stained glass. Creating a custom size does not have to be expensive. That’s because Stained Glass Inc. offers studio direct pricing on all stained glass domes along with easy installation thanks to its modular design process. Saving time on the installation process means further cost savings. Plus, with the help of the Stained Glass Inc. design team, measuring can be perfected to ensure the right size the first time. In addition to creating a custom size and manufacturing a stained glass dome with only the finest quality, environmentally-friendly materials, Stained Glass Inc. can produce the other architectural elements that can be integrated with the dome project. 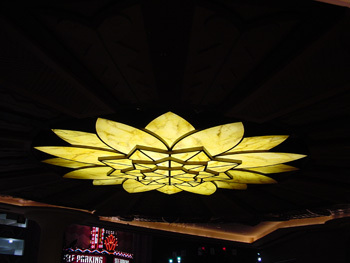 This includes creating custom trim, moldings, columns and coves as well as LED backlighting elements. To learn more about custom size and designs for stained glass domes, please contact our team of stained glass professionals. They are available to provide information or a free estimate by using our contact form or by calling 903-454-8376. Adding a stained glass dome to your structure is sure to provide luminous beauty and create an additional light source that brightens a space or creates a dramatic mood. While having a stained glass dome is a great idea, it does require great skill and artistry, so it is important to find a company that offers those qualities. What Goes into Making a Stained Glass Dome? A stained glass dome, like all stained glass products, involves incredible skill to design and manufacture. First, the stained glass design has to be created and mapped out to work within a grid system in which most of the stained glass products are manufactured. This modular design process makes it easy to make these stained glass designs into any shape and assists in installation. However, careful planning is essential to ensure that the final product turns out like the initial design. Stained glass artists also must be familiar with traditional stained glass processes and new technology to make the stained glass domes. This involves knowing how to work with the materials and create these stained glass products by hand. Considerable time and skill go into manufacturing each piece. At Stained Glass Inc., our team of artisans has worked on numerous well-known buildings across the country and around the world. These famous buildings include the Smithsonian, The National Museum of the American Indian, The United States Capitol, The Pentagon, and Notre Dame. Their stained glass artistry can be found at many cathedrals, basilicas, and churches as well as on display at hotels, casinos, restaurants and universities. Many of our craftsmen and master artisans have over 20 years of experience in working with stained glass and creating all types of products, including stained glass domes. This skilled team is committed to providing the best quality and innovative design. The artists will tell you that they love what they do and that passion certainly shows in every stained glass piece they create. While they know that the best materials are an important aspect, the materials are nothing without a focus on the details, quality, and concern to make sure that the final product is what the client wants. 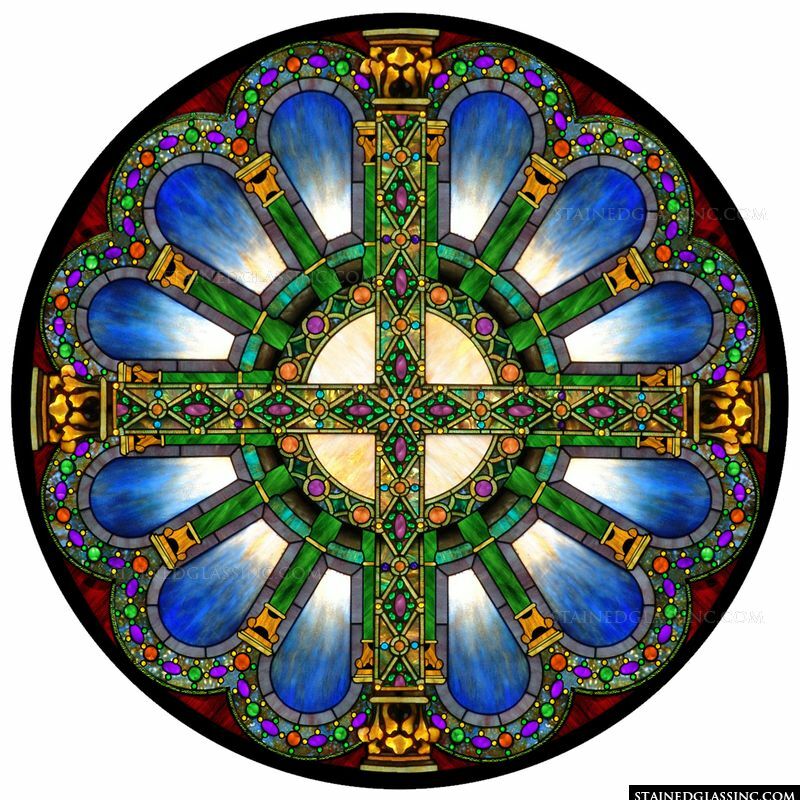 The stained glass artists enjoy working with each client on the stained glass domes and other stained glass projects. Helping clients create that stained glass dome of their dreams is a satisfying experience for them. More Benefits to Partnering with Stained Glass Inc. In addition to the skilled artists we offer, Stained Glass Inc. also delivers other benefits. These benefits include stained glass products that do not use any lead, polymer glass proven to be stronger than regular glass, and rich mineral pigments designed to hold the color for years to come. With a convenient design, production, and installation process as well as factory-direct pricing and free estimates, Stained Glass Inc. offers exceptional value. To learn more about our artists and working with them to create your stained glass dome, please fill out our contact form or call our team of stained glass specialists at 903-454-8376.